Some may think a career in the technology industry is best suited for those heavily equipped with math and science skills versus communication, teamwork, and customer service skills. Think again. Nothing compares to the emotion unleashed when technology issues get between sport fans’ ability to enjoy a game, a guest’s magical experience at Disney, or when lives are at stake during a space shuttle launch. Plain and simple, the technology industry is a complex world orbited by consumer emotion, and business technology professionals need to be able to understand and relate to people as well as to IT infrastructure to be optimally successful. At the 2017 Business Technology Symposium, three industry experts with high levels of responsibility shared how they drive value within their companies by developing new skills, learning from mistakes, and successfully navigating the emotional side of technology. 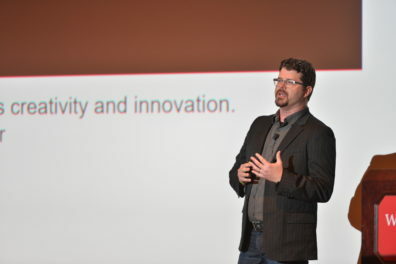 During his sports technology career, which includes managing technology for the Olympic Games and the Vancouver Canucks, Chip Suttles said he learned about the impact winning and losing has on people’s emotions when working for professional sports organizations and the tremendous national pride that plays a role in working for the Olympic Movement. As the Vice President of Technology for Seattle Seahawks and First & Goal, Suttles aligns technology with overall business strategy to improve customer experience and drive increased revenue. “I’m expected to be successful,” he said. 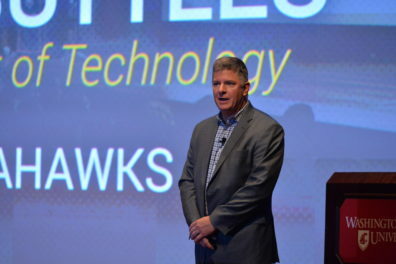 “Technology is ever changing, and the soft skills of managing and motivating people to get projects done on time and on budget is very important.” Suttles is charged with modernizing CenturyLink Field, creating new mobile applications, using analytics, and building vendor partnerships all geared at increasing the fan experience. “I love technology because it’s a lifelong commitment to learning and embracing change,” he said. 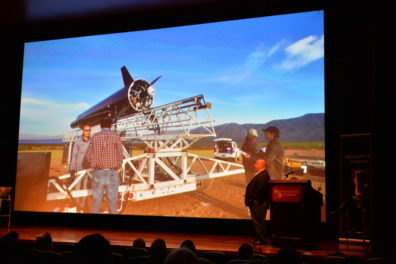 Darren Garber, chief scientist at Vector Space Systems, says technology is a social endeavor. “Technology doesn’t work by itself,” he said. “I do morning rounds two or three times a week to learn how my teams are doing. The social aspect is key, and most projects are group projects—there’s no hero.” He advises future technology professionals to ask themselves key questions before putting infrastructure in place: Am I adding more noise to the system? Is this making things better or is it just a Band-Aid? How robust is the solution? He said whatever field you are in, take a look at the corporate history and documents. Keeping corporate memory is crucial to moving forward on complex tasks. 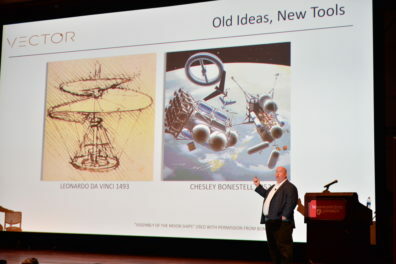 He said this “back to the future” approach—learning and communicating lessons from previous successes—has been beneficial in efforts driving the NewSpace frontier. The speakers all shared a story of a time they made mistakes and their careers survived. Garber related how as a new hire, he sent out a memo detailing what he saw as an error in operational tools used for over 40 years, which was inaccurate. While apprehensive of letting the team down, he decided the best thing to do was follow up with a retraction. Because he quickly took ownership of his mistake and resolved the situation, he ended up earning the team’s trust and respect. Barker described a mistake he made while working as a senior systems analyst at the University of Texas at Austin. He became confused while testing code in a live system and accidently disabled 7,000 university roommate matches. To take accountability, he stayed up 37 hours to fix the problem and learned how to test appropriately in the process. Suttles recalled a time while working at the Olympics when he thought he had expertise in the use of Microsoft Project. He didn’t. Because of software limitation and by following a particular procedure, he mistakenly broke 25 lines of tasks. On the upside, he said he quickly learned his own limitations. To avoid these and other problems, the speakers outlined several tips such as having humility, a can-do attitude, communicating effectively, asking for help, and continually working on soft skills. 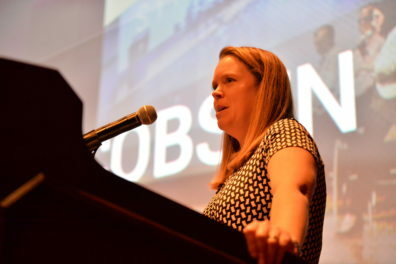 Jaimie Jacobsen (’03 MISE), business manager, Slalom, moderated the Business Technology Symposium, a Carson College annual event featuring a panel of speakers from leading enterprises to discuss current and emerging issues facing information technology leaders. The symposium is sponsored by alumni Steve (’76 Sci., ’84 Engr. & Arch.) and Cyndie Tarr, and Mike (’85 Psych, ’86 MBA) and Amy (’86 Bus. Admn.) Dreyer and is hosted by the Department of Management, Information Systems, and Entrepreneurship.